« Vintage style wooden fishing lures that really catch fish! Wooden crow decoy or magic talisman? It seems that every culture gives some great significance to crows or ravens. The Norse god Odin had two ravens that flew around the world all day and returned at night to tell him all they overheard. Natives of the Pacific Northwest believed that Raven created the land, the animals, and man. Many cultures count the number of crows that cross their path to determine if it is good or bad luck. All this makes crows seem so powerful and fascinating and maybe that is why many decoy carvers slipped a crow in here or there. This crow that I carved from a block of cedar is for sale on my Etsy shop. If you are interested, let me know and I can post a pattern of this on my shop for a few dollars along with some carving instructions. 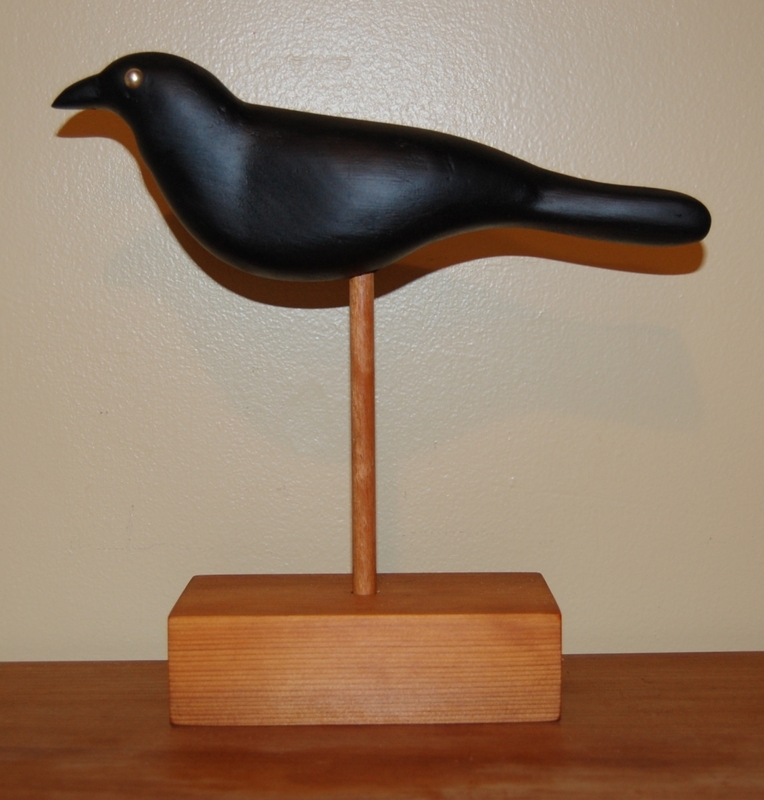 Do you have any crow or shorebird decoys – maybe carved by a grandfather or uncle? I would love to see a picture if you do. This entry was posted on April 11, 2010 at 3:02 am and is filed under Carving, Woodworking with tags birds, Carving, decoys. You can follow any responses to this entry through the RSS 2.0 feed. You can leave a response, or trackback from your own site. You got to check out “Birds in Wood and Paint” by Joseph Ellis. It’s an amazing reference to simple painted bird carvings. I got a copy today and don’t want to put it down. Yeah, on your recommendation, it is on the Amazon wish list. That book looks fantastic.